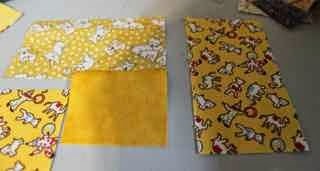 Here are the next two chunks of the Dear Jane Quilt. This is 2A, the middle part of the left hand side. I really like the diagonal movement of the aqua eyeball block near the bottom of the right side. This is section 3A which is the bottom left hand corner. It took the longest because I had to make two of the blocks in order to finish it off. The bottom left corner is M1 and it took FOREVER. 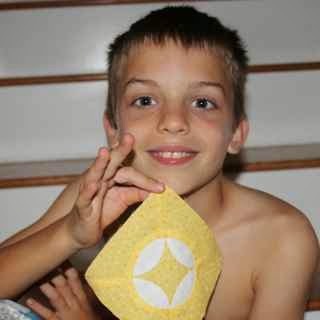 I had printed out paper piecing templates long ago. After making all the subsections I realized that there was no way to get them together. Unsewing the little short paper piecing seams it just no fun at all. I had to draw the other two corners by hand and they seem to be smaller than the original two. Not so much smaller that I felt like doing them again though. The other new block is the red one on the right side. It was easy enough. 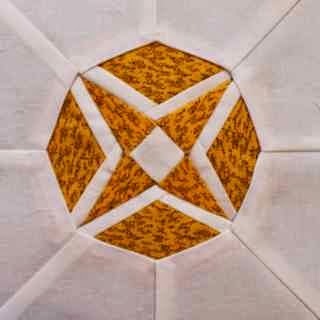 Regular paper piecing with 5 sections. It was mostly a nice peaceful home day. Anna had a quick orthodontist appointment and we all lifted this morning, but other than that we all just hung out at home and chilled. 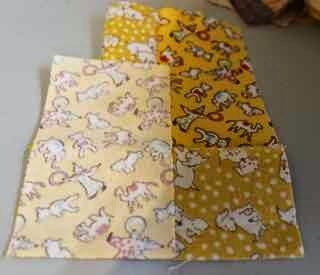 I spent today slowly and carefully sewing together the Dear Jane blocks. After much stalling, I decided to sew 9 large sections. Here is the first one, upper left hand corner. This is the top center section. And here is the upper right hand corner. All the kids are off playing with friends for a bit, so I might get another section done this evening. 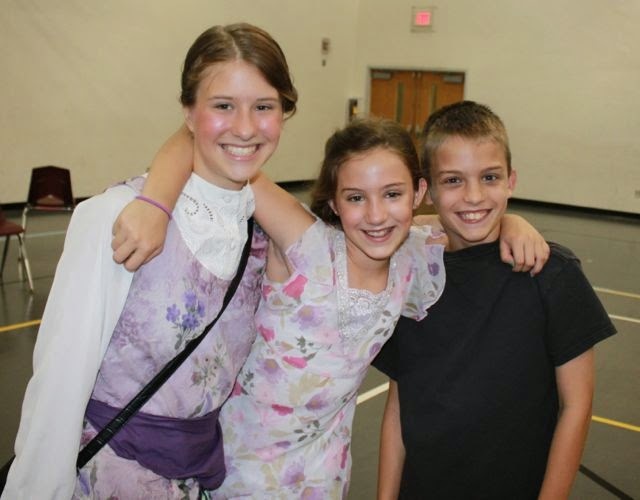 Friday was the play which marks the end of musical theater camp. They did Music Man Junior this year. Anna was Marian the librarian, Sydney was Zaneeta, the mayors daughter and Ryan wasn't in the camp, but volunteered to help with technical. He ran the spotlight. On the way over the causeway I couldn't help but notice the sunset. Though the picture doesn't do it justice, it was a beautiful night. So this week there is absolutely nothing planned. Friday is a holiday, and I'm planning to run a 5K, but until then I can't think of a single thing I have to do. No camps to drive back and forth to, no workshops or training. Nothing at all, I am SO looking forward to it. I've been slowly putting the Dear Jane blocks together. My sister is coming to visit in two weeks and she will want to sleep in the guest bedroom. I think there are still three center blocks to be made, but I'm finally done working for the rest of the summer and should have a bit of time I hope. Putting the blocks together means a lot of time stopping to admire each block while checking and double checking to make sure everything ends up in the right spot. I've decided to first sew everything together in nine large chunks. I should have fewer giant long seams to worry about that way. So far two of the nine chunks are assembled and pressed nicely waiting for the others. The evenings have been pleasantly passed slow stitching on these poinsettia applique blocks. We've almost finished the Harry Potter series, so that is a lot of stitching time. 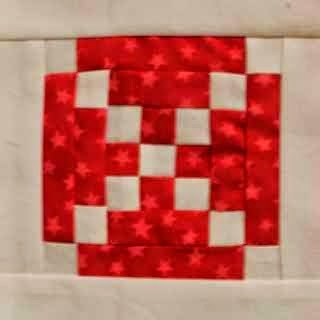 If you are in a slowpoke stitching mood today, be sure to head over the Kathy's Quilts to visit other hand workers. I did a few sampler blocks this month. 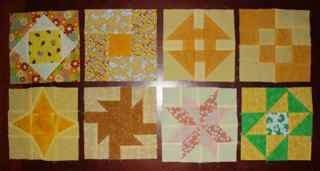 Even finished the yellow Dear Jane blocks. Followed by a few awkward inset seams with reverse applique. Yellow is done though, and I am looking forward to a new color for July. Hope you are all finishing off your June scraps. There are still a couple of days to finish things off though before July gives us a fresh new start and a new color to enjoy. Marly has suggested that we all pull out our rainbow collections so far this year and take a photo of our blocks to celebrate the halfway point of the year. What a great idea! Wednesday is the day that the year will be halfway done. 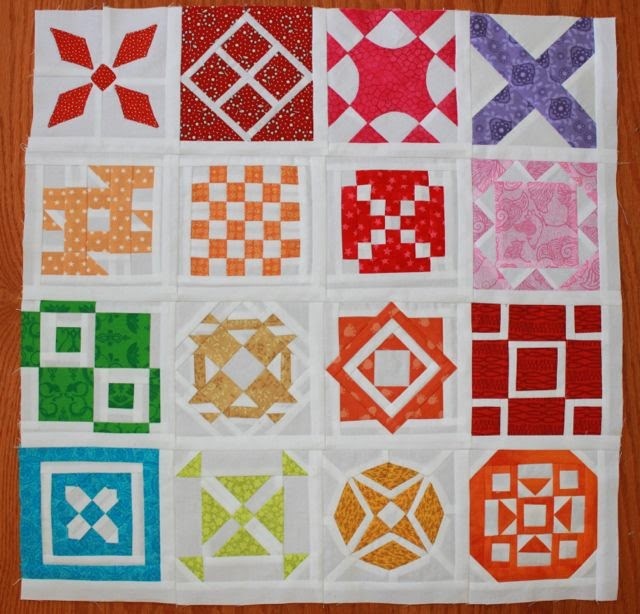 I will put up an extra linky this week on Wednesday for anyone who wants to share a group shot of sampler blocks or of RSC collections for the year so far. Use misterlinky below to share your yellow. After finishing off the yellow blocks yesterday I jumped into the red. This one is J-2. I did traditional piecing and it turned out just a smidgen too big. So the points will be cut off when it is sashed. 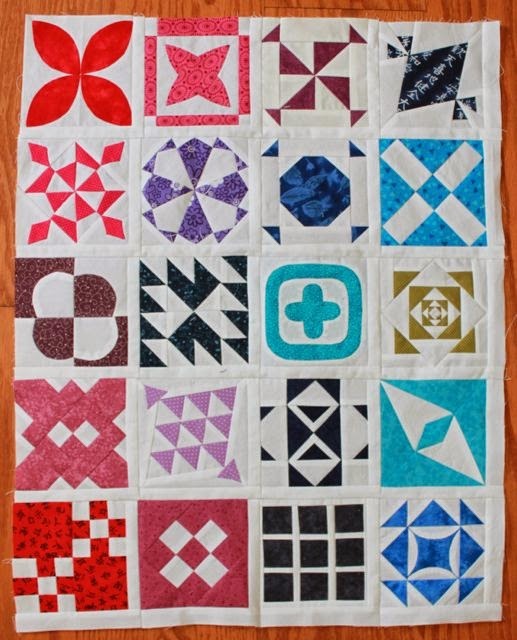 This one was paper pieced last night during a Royal Pains Marathon. I guess a new season started when I wasn't paying attention. There were two new episodes on the the DVR that I somehow missed. Ryan and I spent the morning at the zoo and I'm off to work for a bit this afternoon. We are finalizing homeroom supplies. That should leave me enough time to pick up the girls this afternoon. The last three days of the week are training, so there might not be any more sewing until the weekend. Sigh. Glad I got to enjoy yesterday fully. This one is called Firewood Flower. 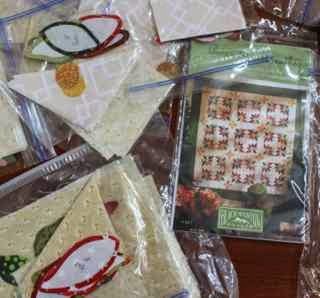 It was a bit tricky, but the tips from That Quilt were helpful in figuring out how to get started. I didn't do it exactly the same, but it worked out pretty well. Still need to finish up the hand sewing on the reverse applique for this one. This one is called Brandon's Star. It was nice and simple. Thanks goodness! Some of these blocks get to be a bit ridiculous. This one wasn't too bad. It is called Sally's Pride. The pattern has little applique triangles in the corners, but I'm wavering about those. I think the middle section is sewed upside down, but I like it fine just like this. This is the one that took all morning! I didn't think it would ever be done. It is called Stephanie's Snowflake and I'm not at all sure it was worth the trouble. 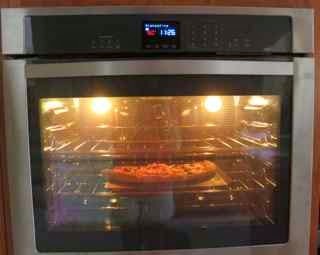 We reheated pizza for lunch in our new oven! The old one was having trouble with the buttons and kept turning itself off. We are slowly converting over to stainless as things break, but for now it is a mixed up free for all. I love that the window is huge so that you can really get a good look at what is cooking without opening it up. It was great to have a day today to just sew without a bunch of running around. The girls are home from camp and it has just started to pour down rain. Maybe I can get one more block in before dinner. Sydney is cooking appetizers for us all! So festive. Sometimes projects get stalled at the most awkward of spots. I was making such great progress on Jane during Christmas break. Then school started again. That seems to be the story of my life. Work gets in the way of my quilting! I'd like to have the wall back at some point. That means finishing up the last 13 center blocks and getting them all put together. Shouldn't be too hard, right? My road map has gotten a little frayed along the edges. I'll take a look at that too and then get back on track. 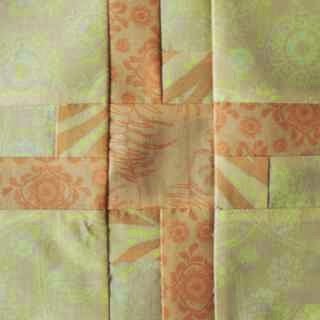 Too see what everyone else is up to, head over to Patchwork Times for Design Wall Monday. It is amazing how much of summer vacation so far has been full of hurry up and rush around! All those projects I save up during the school year could easily fill more than one summer vacation. So on Sunday I am trying to remember that it is OK to slow down and enjoy for at least a little bit. 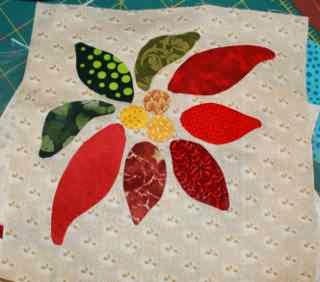 I've pulled out my Christmas Poinsettia applique blocks again to keep them moving along in the right direction. I'm only planning a small wall hanging size. surely that could be done before Christmas? We've been settling down in the evenings lately with a Harry Potter marathon. Part of a movie each evening before bed should give me plenty of time to stitch a petal or two along the way. We've been out and about this morning. The girls wanted to see Maleficent. That was followed up by a quick trip to Joann's to get a few accessories that Anna needed to finish her Music Man costume. 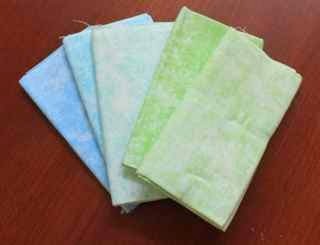 Wanting to get good use out of the weekly coupon, I searched out this little fat quarter bundle of light blues and greens. I find that I don't have a lot of light fabrics to use as backgrounds in my sampler blocks. These should fit work nicely I think. They are in the wash now and so I do believe I'll settle in with some applique while I wait. 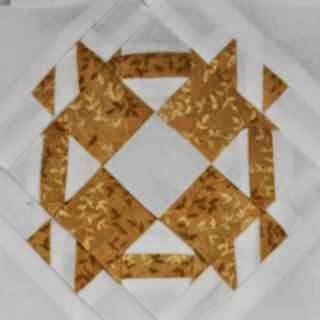 If you are ready for some slowdown on Sunday time, head over to Kathy's Quilts to see what other slowpokes are stitching today. 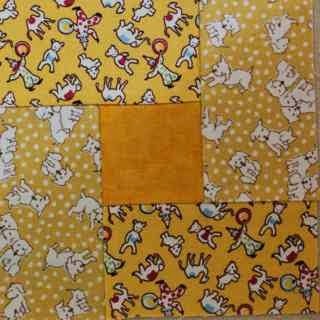 I saw this block on Mari's Blog and thought it would be just too adorable in a 6 inch size. I'm not sure how big her original blocks were, but I'm sure this one is quite a bit smaller. I chose 4 different yellows, though you could use fewer if you like. 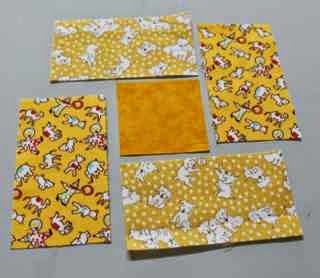 From a light yellow background fabric cut 4 - 2.5 inch squares and 4 - 1.5 inch squares. 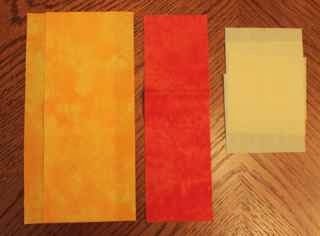 You will also need one 2.5 inch square of darker yellow. 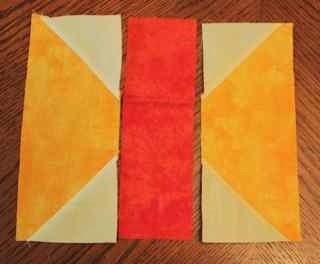 Next cut 4 rectangles that are 2.5 by 1.5 inches using another yellow. 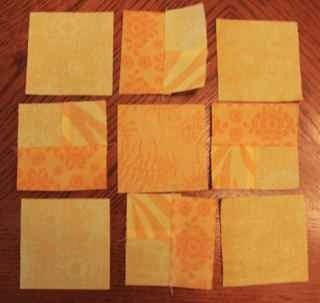 Finally cut 4 1.5 squares of a different yellow. Start with the 1.5 inch squares. 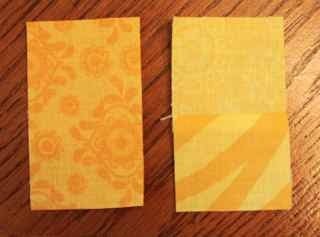 Sew one background square to each darker yellow square. Press to the dark. 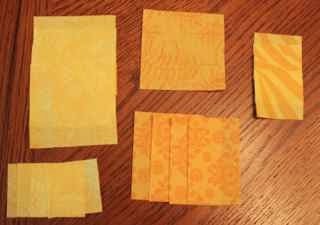 Next sew those twosies to your rectangles. Press toward the rectangle. Now you should have 9 squares that are each 2.5 inches. 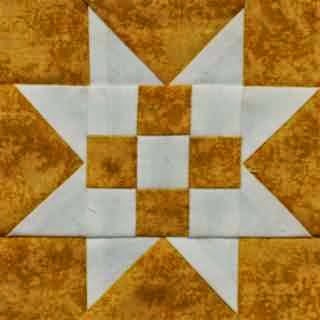 The dark yellow forms the middle while the pieced units should rotate around with the darker squares touching the center. Sew together as you would for any nine patch. There you go! The placement of the dark rectangles give it a bit of a pinwheel twirl. I think the color shows up best in this last shot. Getting enough contrast with yellow is just not easy! We've done small butterflies already, but there hasn't been a large butterfly yet. 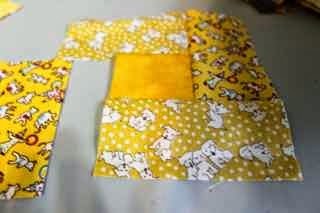 It is a quick and easy block with large pieces. Love those. 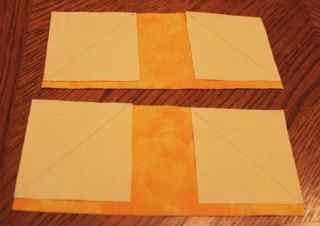 For the wings you will need 2 large rectangles of dark yellow, each 3 by 6.5. From a light background fabric cut 4 squares, each 2.5 inches. I used an orange for the body because finding enough contrast with just yellows can be tricky. It is cut 2 inches by 6.5 inches. Use a pencil to draw a line corner to corner on each of the 4 background squares. Place one background square, right sides up on each end of the wing pieces. Notice that they are a bit smaller than the wing, this is by design. Both diagonals should point up and to the middle, making a little mountain. 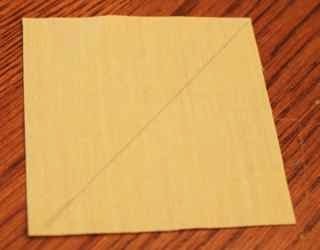 Sew along the diagonal. 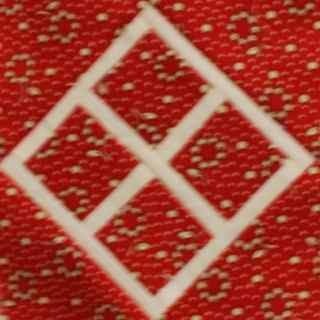 You may also double sew for bonus triangles if you like. Flip and press the background squares and arrange them on either side of the body. Sew each wing to the center. There you go. simple and fast. I almost completely forgot about ScrapHappy Saturday this week! Days of the week feel very different during summer break. I went out bright and early for a run with my good friend Meisje and then took the kids to catch up on the power lifting session that we missed on Friday morning after the turtle walk. It wasn't until I showered and finally sat down to check on e-mail that it occurred to me that it was Saturday and I hadn't posted a linky party! So sorry! Speaking of blog business, I used the random number generator at Random.org to choose a winner for this month's hand dyed fabric giveaway sponsored by the generous Vicki Welsh. 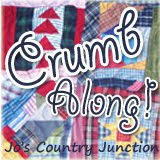 The lucky winner this month is Julie in Georgia who blogs at Julie's Quilts and Costumes. 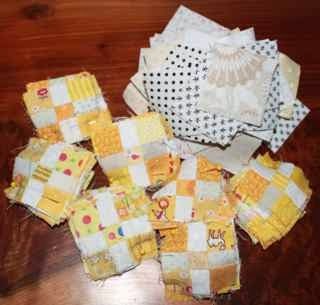 I have just a few more yellow blocks to work on today. I don't want to get too carried away with yellow because it can be a bit much in large quantities. 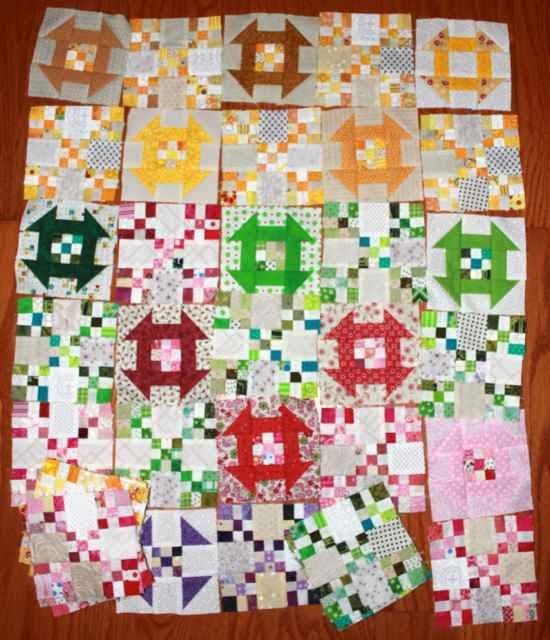 I've also been working ahead though to make sure I have enough blocks to finish up the quilt this year even when school starts to get crazy again as it most certainly will. 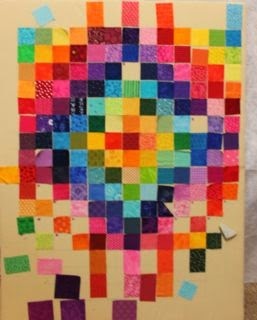 You can check out upcoming blocks on my Pinterest page as long as you don't try to figure out which colors are coming up based on the order of the blocks. I am trying to keep you all guessing, though that gets harder as we use up more of the colors of the rainbow. What yellow projects do you have going on today? Use misterlinky to keep us all posted on your progress. Ms Johnson is my next door teacher at school. She had reserved 3 spaces for a sea turtle walk ages ago, but couldn't go. So Kurt and Ryan and I went instead. 15 years ago when we came to here for Kurt's second job interview we stayed at a hotel on the beach. The first night we watched dolphins swimming in the offshore. Then in the morning we got up early for a morning walk on the beach and almost stumbled over an emerging sea turtle nest. They had started hatching during the night and we watched as the last few turtles finished making their way to the water. Kurt says he knew at that moment we were moving to Florida. So last night started at 9 with an educational talk while scouters went out to the beach to search for nesting females. They look for tracks coming up out of the water. Both Greens and Loggerheads nest here, but you can only watch the Loggerheads which are threatened and not endangered. They have distinctive tracks which are easy to tell apart. I didn't take any pictures, because it was dark and you are not allowed to have anything with a light to disturb the turtles. Before long we got a call that there were a couple of females headed up the beach and starting to dig. We waited until the nest was dug because by then they are fully committed. Once the labor started they called us all down and we hiked down the beach to the nesting site. The first lady was missing a back flipper and and having trouble, so we let her be and went on to the second. As we arrived she was just getting ready to drop her first eggs. As we sat and watched, she dropped over a hundred eggs! One after another, plop, plop, rest plop. The ping pong sized eggs slowly filled up the nest. Then she covered it all back up with sand and camouflaged the nest before turning around to heading back to the ocean. We all watched as she finally made it to the water and cheered as a big wave helped carry her away. Then as we started to head back, the injured turtle was also plodding back to the water and we watched her return as well. It was almost midnight when we finally made it back to the welcome center. So we skipped power lifting this morning. I would have been OK with a nap later, but poor Kurt has to work. The girls are off to theater camp again today. They are doing Music Man Jr.. Anna is Marian the Librarian and Sydney is Zaneeta, the mayors daughter. They even recruited Ryan to help with the lights and sound during the show. Much excitement for everyone! 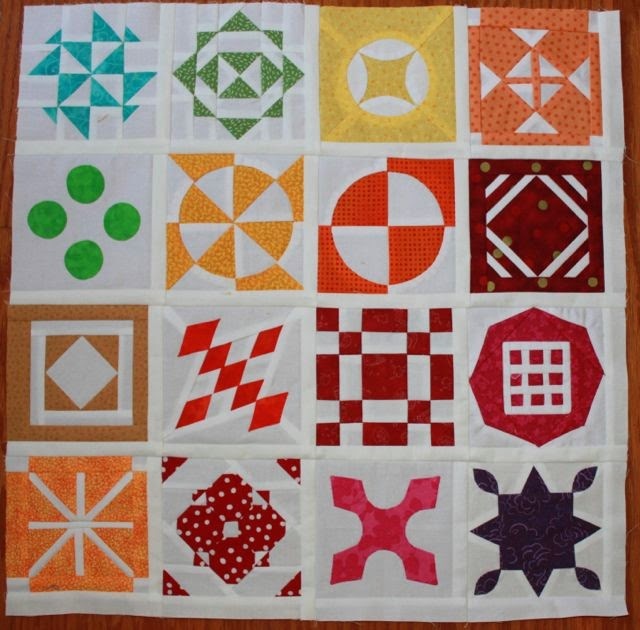 I worked a bit this week on making some churn dash blocks to go with the baby nine patches that have been in the works for a couple of years now. The entire block comes from just a light and dark 2 inch strip which makes planning pretty easy. 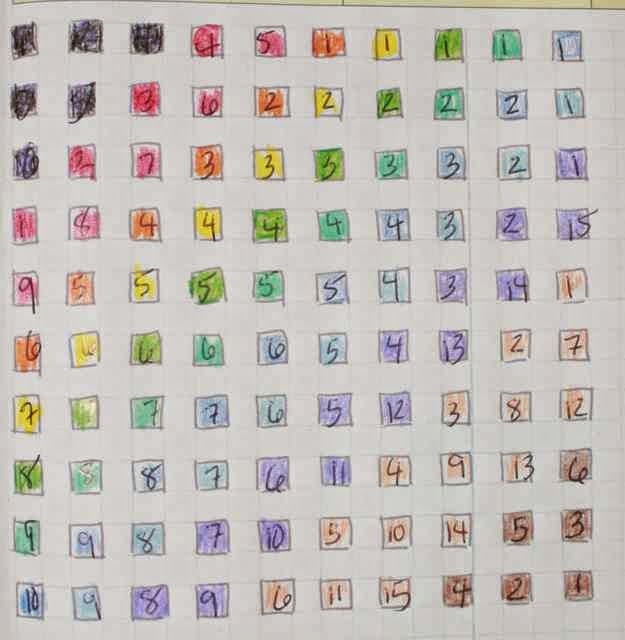 Speaking of planning, I was starting to think about the math for my Rainbow Scrap Challenge Sampler Quilt. The colors are going to be in diagonal stripes and ROYGBIV order. 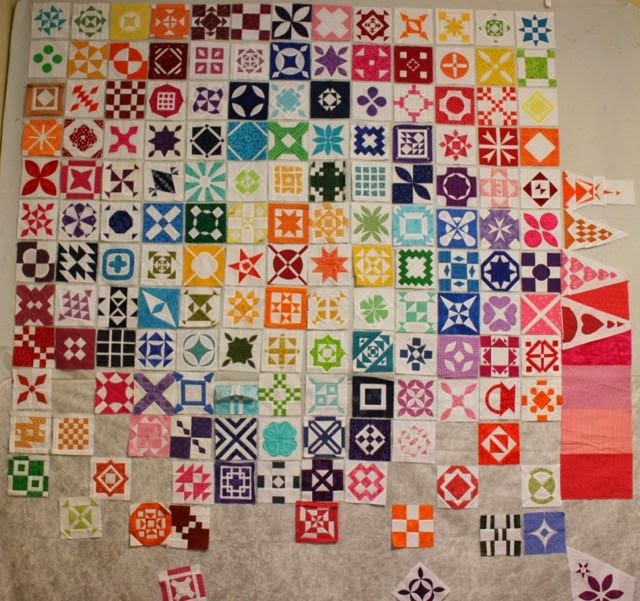 I'm about halfway done with the quilt, and also halfway done with the year, so I think it will all work out. 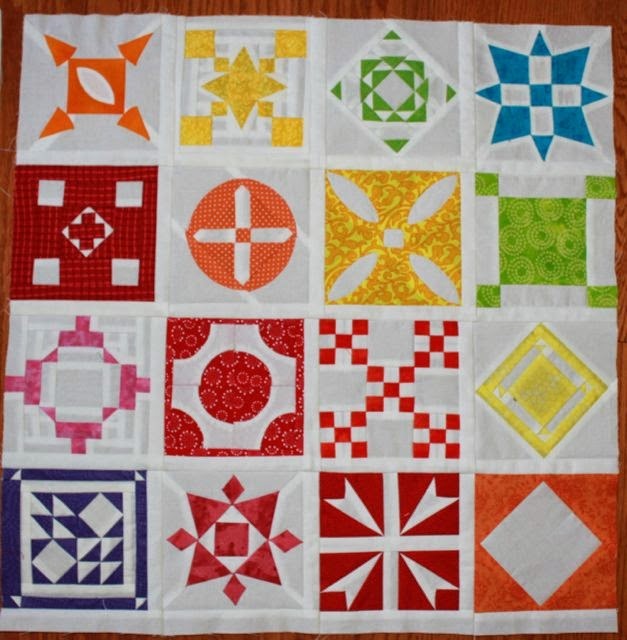 Be sure to visit Judy's Blog to see what everyone else has on their design wall today. Yellow sure does brighten things up! 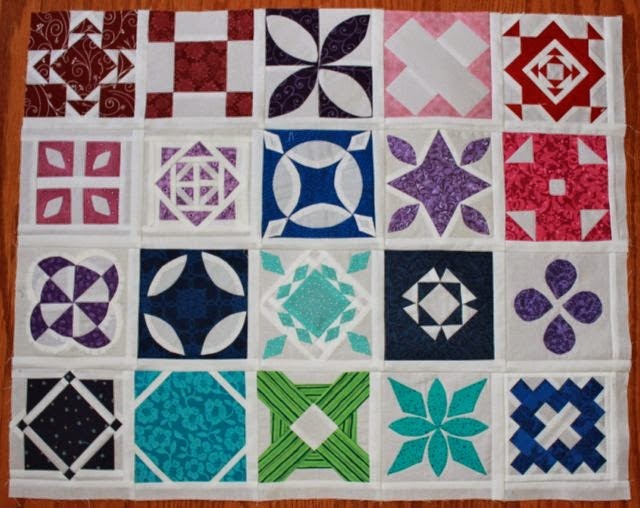 There have been 7 sampler blocks so far this month. One of them was accidentally posted earlier though, so be sure to check out the RSC Sampler page for links to all the tutorials. 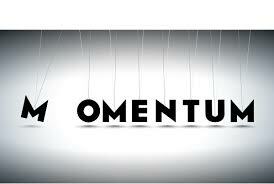 Follow the link or look for the tab at the top of the page. There are also pictures of all the blocks on my Pinterest page if you want a sneak peak at the ones that haven't been posted yet. I'm thinking about working ahead a bit now that summer has come. The girls will both be at a theater camp for the next two weeks so it will just be Ryan and I rambling around the house together during the day. I might just take advantage of the opportunity. I hope you are all finding some time to sew a bit these days. I know summer is the busy season for a lot of you with gardening and kids out of school for the summer. Still I hope you are all finding a few minutes each day to stop and enjoy some quiet sewing time. Use misterlinky below to share your yellow projects. 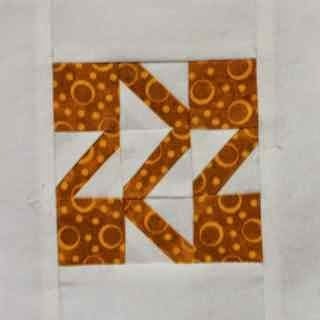 This block is simple enough, but when you look at how to sew it together, it gets a bit tricky. There isn't a good place to start because the seams all rotate around and interlock. You could solve this problem by splitting one of the rectangles into two squares. That does introduce an extra seam though. Using partial seams is another solution. It isn't as hard as it might seem -- so give it a try -- you might like it! You will need a central square that is 2.5 inches. In addition you will need 4 rectangles that are 4.5 by 2.5 inches. 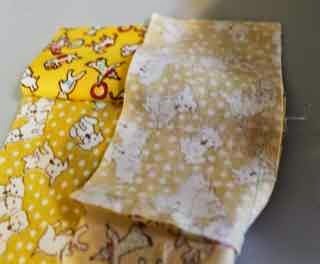 I chose to use two each of two fabrics, you could also use a different fabric for each. Here is the basic block design. The four rectangle rotate around the center square. Finding a starting place is accomplished by sewing half of a seam instead of a whole seam block. Place the center square, right sides together at the right end of the top rectangle. 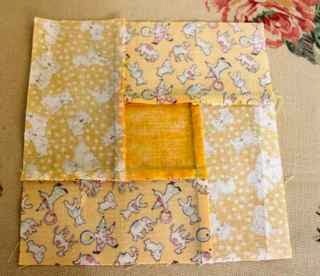 Instead of sewing the entire square, start right in the middle and sew to the end. Now you have the square connected, but the end of the rectangle has some space to join the last seam at the end. Finger press away from the central square. 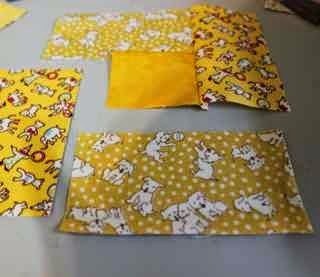 Fold the right rectangle on top of the joined unit and sew a normal seam. Open the right side up and finger press. Next, move on to the bottom rectangle. Fold it over, right sides together. Sew this on as a normal seam. You are almost back to where you started. For the left rectangle, make sure your top rectangle stays out of the way for just a bit longer. The partial seam from the first step should make this possible. 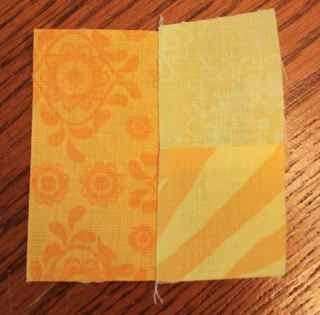 Sew the left side on with normal seam. Now you are ready to complete the cycle. Open and finger press the left side rectangle. 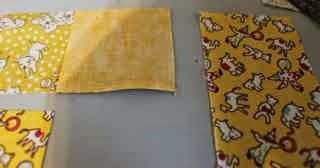 Next fold your partially sewn top rectangle back down and sew from the end to the point where your first seam stopped. Here is what it looks like from the back. Every seam is normal except that first one. Half of it was sewn at the begining, and half was sewn at the end. And here is your finished block. 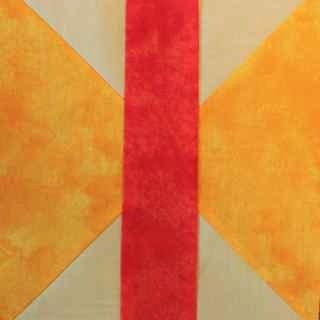 This is one that would be easy to change up by using a larger center square or different combinations of fabrics. 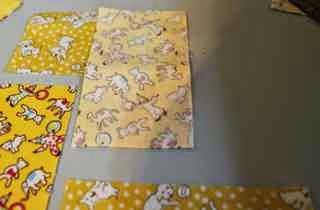 ScrapHappy Saturday in Happy, Sunny YELLOW!